Today is our last day of summer break and I'm all mushy about it. Last year I all but shoved the kids out the door (here!) but it's a little different this time. Parker is off to first grade and we really can't believe it. I suppose it's just that first time round that it's a nerve wrecking job sending your child off to school with loads of other kids and adults you really don't know and for the majority of his day (not saying I want to home school, just to set that straight). My 6 year old will be sitting in his very own desk (right in front of the teacher's desk too!) and day in and day out he'll be practicing all of the things we have worked so hard to teach him here at home, the character stuff ... now putting it into action. How will he do? And I'm still boggled by the fact that he'll be there from 7:55am to 3:15pm, a longer day for my first grader than I even had as a senior in high school. That kills me! Wake up time will not be the same again, that's for sure. I'm nervous (can you tell?) and I hope that this goes better for him than it is currently going for me. :) I'm just awed by the fact that this is where we are now, that next stage of family life is knocking at our door. My relief is in the fact that I know he will be safe there, cared for and loved, respected and challenged. God, be with him and help him in his new adventure. Every minute of every day. Oh yes, and be with me too! wow, first grade. 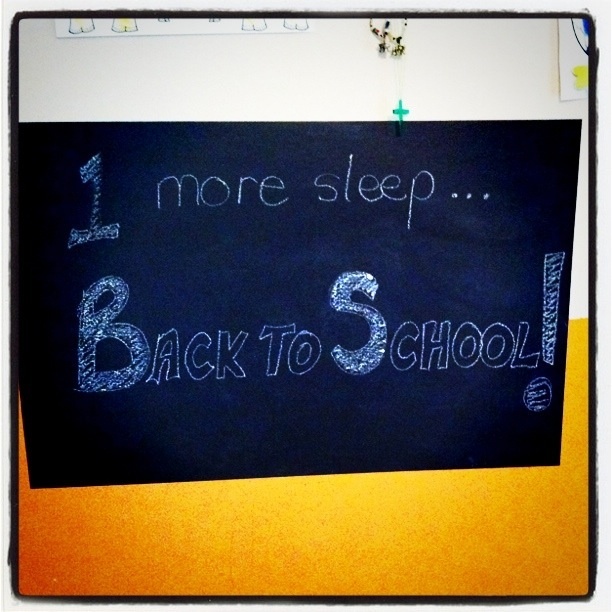 hope the first day is good for you all!